The flag was designed by local resident Elda Huel many years ago. The Church represents the Our Lady of the Assumption Cathedral which was (and still is) the key focal point of our community - as it was founded by Father Gravel who encouraged Quebec Francophones to migrate to this area. 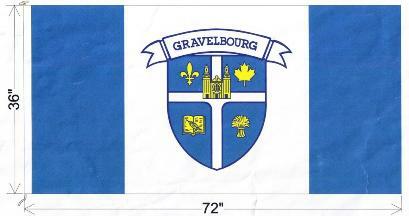 The other components of the flag represent "education" which again is a key tenet of the community with College Matthieu, Ecole Beausouleil, Gravelbourg Elementary and Gravelbourg High Schools. The "fleur-de-lis" representing the Francophone heritage; the Wheat Sheath (represents the prairie grains of Saskatchewan and finally the Maple Leaf symbolizes our membership in the Dominion of Canada. Tincture is AZURE representing the blue open sky of the prairies. The field is then BLAZONED PER CROSS which represents the various religious orders that were responsible for the development of the town. The ARGENT WHITE representing the new land. In the dexter chief canton is the Fleur-de-lis for the French ancestry. In the sinister chief canton is the Canadian maple leaf. In the dexter flank is the book and quill representing the education institutions in Gravelbourg. The sinister flank has a wheat sheaf representing the main industry of the town. The colour of the charge is OR (gold) representing the golden wheat fields and prairie. The HONOUR POINT contains the Cathedral which still dominates the Main Street today and helps make our town unique.